As a wife, I know just how important to a relationship it is for a man to be able to express his emotions and tell you how he is feeling and why. As a mother, I also think that it is important for boys (and girls) to be able to express their feelings. The first part of this involves teaching children about emotions and then teaching children to express their feelings in productive ways. The added layer to this is conquering any false ideas that say men and boys can’t express feelings without being labeled as weak. In fact being able to own your feelings and express them in a good way is absolutely powerful and admirable in both women and in men. That is why as parents, we need to be teaching boys to express emotions and not bury them away. Ericka Souter shares how she works to help her son express his emotions. She says, “I’m trying to teach my little boy… how to dissect what is going on and process it in a different way as opposed to being grumpy or angry or sad.” That is indeed the first step- helping the child understand how he or she is feeling. Getting my son to express his emotions is a parenting challenge I face with my own son so I thought it would be great to talk about. My son, Leo, is 7 and he has always been fairly good at communicating. In fact, my husband calls him, “The Professor”, because my son is always beginning some long discourse with, “That’s because…” However, when it comes to sharing his emotions, my son shuts down. He just goes into another room and hides under a blanket or pulls his shirt over his head. I have been working with Leo for some time now and he is slowly progressing from turtle phase of withdrawing completely to being able to talk about his emotions with prodding. I explain to my son that we don’t know how he is feeling unless he tells us. Sometimes he needs help identifying his feelings so I give him multiple options when he says he doesn’t know how he feels. That is the first obstacle to children expressing their feelings. They must first learn to identify what emotion they feel- this is called emotional awareness. Share with your child the basic emotions: happy, sad, angry, and fearful. Help them think about which one feels most like what they are feeling. We can’t read minds. I explain to Leo that it is important to talk about how he feels so that we know if we did something that hurt his feelings and so that he can understand why we did whatever we did. I also try to get him to figure out what would make him feel better. For example, if he is angry at his sister for laughing at him, would an apology help? Would some time alone help? I try to get him to figure out his feelings, express them, and think of solutions. Teaching boys to express their emotions can be a process that takes a lot of time and attention but I think that he will be a much better person for it. Do you struggle with teaching your boys to express their emotions? 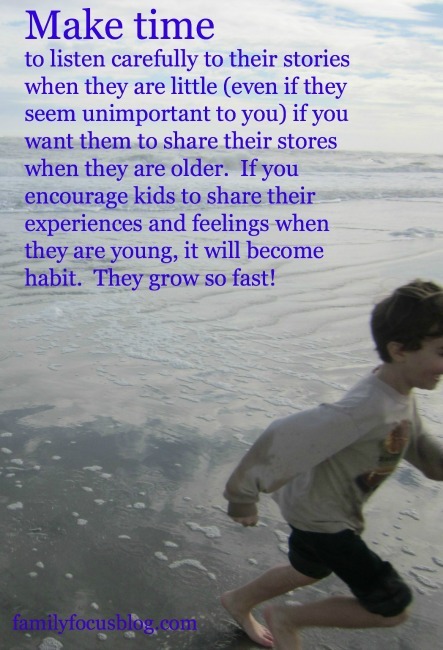 What are some of the parenting strategies you use to improve communication in your household?